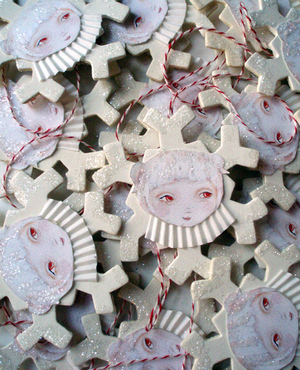 I wanted to share a peek at the two kinds of ornaments I will have for the Christmas/Holiday update on Friday! 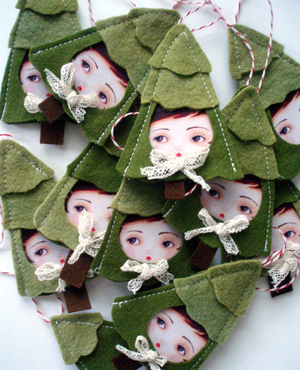 These woodland sweet-peas are crafted of wool felt, paper, string, and mini-print. They measure approximately 3.5" tall, not including the hanging string. These glittering girls are crafted of hand-painted wood, paper, string, a generous dusting of coarse glitter and mini-print. They measure approximately 3.25" tall, not including the hanging string. They will be individually packaged up sweetly in a glassine envelope, and sealed with a festive sticker. I hope you that you like them! And thanks for all the fun chatter around my last post...I can't tell you how happy it makes me that there are so many unashamed Stevie/'Mac appreciators out there. Those comments were some of the sweetest and funnies ones ever.